Chinese security came out in force and there’s been a fair amount of coverage of them swarming over our activists and taking down the banners. I have to say, I got a big kick out of the sight of a Chinese police raising a Tibetan flag on TV. No matter how many times the IOC and BOCOG promised that the Chinese authorities would grant Olympic journalists freedom and access, you always knew that something like this was possible and the intensity of the Chinese police aggression belies every single word uttered by Jacques Rogge in the years leading up to the Games. The Chinese government has not been changed one iota by the Olympics. Yet everywhere you look, you can see how the Beijing government has brought their style of brutal occupation and militaristic policing to the Olympics. Watching the Chinese police beat and harass activists and journalists today with the whole world as their guests in Beijing makes me truly fearful for what they will do and are now doing in Tibet, behind closed doors and with no foreign journalists there to watch. Via F.X. Leach at Tibet Will Be Free, the Washington Post has a chilling account of a Tibetan woman trying to return to China from the US with her two young children. To prevent such protests inside their own borders, Chinese authorities recently threatened to take away one female activistâ€™s two babies as she tried to enter the country. A Tibetan woman surnamed Kemo was returning to China on July 18 after nearly two years in the United States, where she had had two children. She was stopped by a passport control officer, escorted to an interrogation room and asked whether she had ever participated in political protests. â€œYes, but a long time ago,â€ Kemo said she replied, speaking on the condition that her first name not be used. Officers then showed her computer printouts of photos of her participating at various U.S. protests. â€œYou are lying to us,â€ an officer told her. Officers pried the children away from her, slapping her and one of her children when he clutched her purse strap to prevent her from being taken away, she said. The officer then gave her a choice: accept deportation and buy plane tickets to take her children back to the United States or go to jail and lose her children. After she bought the tickets, police escorted her to the next flight to New York and returned her children on the jetway to the airplane. This is what they do to someone in an airport, someone who’s live in the West and could return to New York and tell the press how she was abused and mistreated at the hands of Chinese security and how their abuse extended towards hitting her young children and threatening to kidnap them…just imagine what the Chinese government is doing to Tibetans inside of Tibet now. And if you are shocked that China is spying on Tibetans at protests in the U.S., in New York City…just imagine the power of the Chinese surveillance state inside Tibet. This happened on the eve of the Olympics. To say that change is the same as it ever was would be a horrible understatement. Their treatment of Tibetans is getting worse. As you’ve seen here, the Chinese authorities finally detained Paul and me yesterday afternoon. I guess they couldn’t bear the idea of us running around Tiananmen Square during their one-year countdown bash. Well, what happened next confirms my suspicion that China has been feeling the heat in a big way. They reunited us with our friends, the “Great Wall Six,” (ha ha!) and flew us all to Hong Kong, where we were met at the airport by friendly faces and TV cameras. We’re here. We’re safe. We’re proud. We’re really, really tired. More soon. Update: I’ve posted a short video below, recorded just after our arrival in Hong Kong, that shares some of my quick thoughts on our detention, the reality of “openness” in China, and my hope for the impact of our efforts… much, much more to come. UPDATE 8/8 12pm Eastern: We’ve received a quick call from Lhadon saying that she, Paul, and the “Great Wall 6″ were being put on a plane to Hong Kong. We have no official word at this point. As this is Lhadon’s blog, we hope the next post up here will be from her, somewhere safe and sound. Stay tuned. SFT staff: We recorded this video from a live skype videoconference with Paul and Lhadon at an Internet cafe about a day ago. They thought at the time they were going to be picked up by one of the thirty “minders” (aka plain clothes security agents) outside. They were able to return Tuesday evening to their hotel without incident. Unfortunately, at about 2pm on Wednesday in Beijing, Lhadon and Paul (who has been accompanying her during this trip), were picked up by uniformed Chinese police and taken for questioning to a local police station. At this point, we haven’t heard from them since a text message sent by Lhadon confirmed this shortly after their detainment. Please keep Paul and Lhadon and the other Tibet activists detained in Beijing – Sam, Mel, Leslie, Nupur, Duane, and Pete – in your thoughts, and continue to spread the word about this blog. We will provide more information here as it’s available to us, as well as ways for you to take action. For now, if you feel moved by the work that Lhadon and Paul have been doing, please participate today in the August 8th International Day of Action or consider donating to SFT’s Olympic Action Fund. 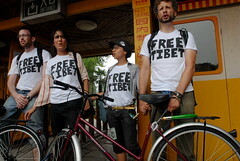 Hong Kong – On the day of the one-year countdown to the Beijing 2008 Olympics, Lhadon Tethong, a prominent Tibetan independence activist and the Executive Director of Students for a Free Tibet, was detained in Beijing. Ms. Tethong was picked up by Chinese authorities together with her colleague Paul Golding, a long-time advocate of Tibetan freedom, and taken to a Beijing police station. For the past seven days, Ms. Tethong, a Tibetan-Canadian, has been traveling in Beijing, openly blogging at www.BeijingWideOpen.org to expose the reality behind Chinaâ€™s propaganda campaign surrounding the Olympic Games. She and Mr. Golding have been under heavy scrutiny from Chinese authorities, followed at all times by several vehicles as well as plainclothes security officers on foot. This number increased to 30 plainclothes followers after a protest by six activists from Students for a Free Tibet yesterday on Chinaâ€™s Great Wall. Tethong and Golding’s abrupt detention comes just hours before tens of thousands of people, including national Olympic Association delegates and members of the International Olympic Committee, are gathering in Tiananmen Square for the official countdown celebration. Chinese authorities have not responded to requests by relevant embassies of the six Tibet activists detained on Tuesday for unfurling a 450-square foot banner reading “One World, One Dream, Free Tibet 2008″ in English and Chinese. The whereabouts of the six activists are still unknown. 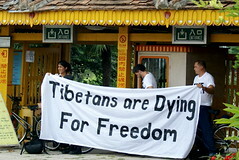 Tibetans and supporters around the world â€“ from New Delhi to Rome to Ottawa to New York â€“ are holding protests today to mark the countdown, calling on China for a resolution to its occupation of Tibet by August 2008. Students for a Free Tibet (SFT) is a network of young people and activists campaigning for Tibetan independence, with 650 chapters in more than thirty countries worldwide. SFT is based in New York, with offices in Vancouver, London, and Dharamsala, India. 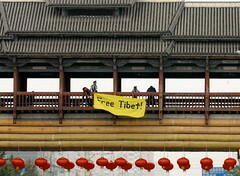 www.studentsforafreetibet.org. You are currently browsing the Detainment category at Beijing Wide Open.